For fans of roots music, The Jayhawks' new anthology, Music From The North Country, is an excellent study of the sound as well as a marvelous overview of the band's career. This double disc plus DVD collection assembles tracks dating back to their 1986 debut album, their Twin/Tone Blue Earth release, and their five successive Def American/American Recordings that include classic '90s works such as "Settled Down Like Rain" from Hollywood Town Hall, "Blue" from Tomorrow The Green Grass, and "Save It For A Rainy Day" (no, not the Stephen Bishop song) from their last studio outing, 2003's Rainy Day Music. Taking off with their own unique alt sound, The Jayhawks (whose moniker was derived from Bob Dylan's old backing troupe, The Hawks aka The Band) were influenced initially by other avian ensembles like The Flying Burrito Brothers, The Byrds, and even a bit by the early Eagles. But the music that founding members Mark Olsen and Gary Louris created was pioneering, especially for the '80s, and in turn, it was used as a blueprint for any number of alt-country bands that followed. Once called "The only country rock band that matters" (The Village Voice, 1989), Olsen's and Louris' Everlys-meets-Louvins harmonies and variation on country rock found many fans, such as Def American producer/A&R guru George Drakoulias (who heard the group's music in the background while on a phone call to Twin/Tone), and fellow Minnesotan, Bob Dylan, who had the band open for him. The Jayhawks also found themselves gigging with Johnny Cash and playing at Farm Aid, so by the mid-'90s, this was the group to watch, pretty much poised for mega-success. But timing and band members' entrances and exits--including Olsen's in '95 when he moved to California, eventually recording with his wife, Victoria Williams--stunted their career's growth, leaving Louris (who, himself, had exited the band briefly in '88 following a car wreck) to attend a revolving door membership and constantly shifting sound. However, over the course of seven studio albums and singles such as a couple of the above-mentioned plus "I'm Gonna Make You Love Me" and "Waiting For The Sun," every line-up contributed great personnel and recordings to the band's colorful history. In addition to Olson and Louris, semi-consistent membership included bassist Marc Perlman, drummer/vocalist Tim O'Reagan and keyboardist/vocalist Karen Grotberg; and though the group's various configurations and musical styles have challenged its followers, The Jayhawks' fan base remains loyal, rewarded recently by the news that Olsen and Louris, already having toured as a duo with and without JH band members, will reunite for another album. Though the pair's harmonies always were magic (check out early tracks like "Ain't No End" with its stunning Gram Parsons/Chris Hillman voicings), the group's musicianship equaled its vocal prowess. Beyond the joy that is the first CD of Music From The North Country (that expertly frames The Jayhawks' roots-pop revolution), the second CD is filled with gobs of rarities and unreleased tracks, plus their fraternal music vids with a couple of live performances shape up the DVD. This collection, serving as an efficient recap, hopefully sets up their new Jayhawks project to soar even higher than past flights. This is pure '60s heaven. All six of that decade's "Charlie Brown" TV specials have been gathered for this sweet release, covering everyone's childhood favorites A Charlie Brown Christmas and, of course, It's The Great Pumpkin, Charlie Brown. Included in the next tier of specials, though not as essential perennially, are the pop-iconic You're In Love, Charlie Brown (that introduced us to Peppermint Patty), Charlie Brown's All-Stars (featuring the famous "stealing home" scenes and Charlie's uniform being made out of Linus' blanket), and He's Your Dog, Charlie Brown (where the mischievous Snoopy ends up with a weirdly strict Peppermint Patty before returning home to good ol' CB). Also included is an endearing 37 minute documentary on Vince Guaraldi, the jazzmeister behind the most popular Peanuts themes. The feature guests Guaraldi's past band members, his son David, and George Winston and David Benoit, both of whom have released albums of material by the composer. Peanuts producer Lee Mendelson gives the back story on his hearing the pianist's "Cast Your Fate To The Wind" on a jazz station, then hunting the artist down to supply music for a documentary he wanted to film on Peanuts creator, Charles M. Schultz. That led to Vince Guaraldi's excitedly playing "Linus & Lucy," immediately after its creation, over the phone to the film maker so that it would be remembered by at least one of the two. LOS ANGELES -- Following the reissue of the 14 Genesis studio albums in the stunning boxed sets Genesis 1976 - 1982 and Genesis 1983 - 1998 in 2007, Genesis 1970 - 1975 in 2008, on September 29, Rhino will release Genesis Live 1973 - 2007, a boxed set gathering the four live albums recorded by the legendary British group from 1973 to 1992. Featuring brand new stereo mixes, the boxed set also includes the long-awaited release in stereo and 5.1 of Live At The Rainbow 1973 only available with this collection. The Way We Walk, finally sees these two live albums re-sequenced as per the original show's set list. Originally released separately and entitled Vol I: The Shorts, which made the Top 3 in Britain in 1992, and Vol 2: The Longs, this was the band's sixth #1 album, and their only concert recording to top the charts in 1993. Recorded at Leicester De Montfort Hall and Manchester Free Trade Hall in February 1973, Genesis Live was not originally intended for release but rather mixed to be broadcast on the King Biscuit Flower Hour show on US radio. It comprises versions of the melodramatic set opener "Watcher Of The Skies" and "Get 'Em Out By Friday" from Foxtrot, the band's fourth studio album--which had reached #12 in October 1972--"The Return Of The Giant Hogweed" and "The Musical Box" from 1971's Nursery Cryme, the first album featuring Collins and Hackett, and the tour de force quiet-loud dynamics of "The Knife," from Trespass, the group's 1970 debut for the Charisma label. Given the band's growing reputation for its theatrical shows, it is no surprise that Genesis Live spent ten weeks in the charts in 1973, paving the way for the release of Selling England By The Pound later that year. The album's iconic cover features Gabriel wearing one of his many costumes, in this case the "Magog" mask and black cape he donned during "Supper's Ready." Recorded at the Palais des Sports in Paris with the Manor Mobile studio in 1976 and 1977, Seconds Out stayed on the British charts for four months. The double set was much more in keeping with the times, the increasing availability of bootleg recordings and the phenomenal success of Frampton Comes Alive! Former Yes and King Crimson drummer Bill Bruford had joined Genesis for the 1976 dates and features on "The Cinema Show," one of two tracks from Selling England By The Pound. The other, "Firth Of Fifth," and the rest of the album, features Chester Thompson, a drummer best known for his work with Frank Zappa and Weather Report at the time. Collins tackles Gabriel-era material like "The Musical Box," "Supper's Ready," "The Carpet Crawlers," the title track from The Lamb Lies Down On Broadway, and "I Know What I Like (In Your Wardrobe)," the group's first hit, with aplomb. "Squonk," "Robbery," "Assault & Battery," "Dance On A Volcano" and "Los Endos" came from A Trick Of The Tail while "Afterglow" originally featured on Wind And Wuthering. Hackett left while Seconds Out was being mixed. The album's distinctive cover and the other pictures used were shot by Armando Gallo, the band's biographer. Recorded in Germany in 1981, Three Sides Live was originally released in 1982 as a double vinyl set with a fourth side of studio recordings -- basically the 3X3 EP and two B-sides--in the US while the European version contained three more extended live tracks. The studio versions of "Turn It On Again," "Behind The Lines," "Duchess" and "Misunderstanding" featured on 1980's Duke while "Dodo," "Me And Sarah Jane" and "Abacab" first appeared on Abacab in 1981. "Follow You Follow Me" came from ...And Then There Were Three... and "Afterglow" and "One For The Vine" were originally recorded on Wind And Wuthering. "The Fountain Of Salmacis" harked back to Nursery Cryme and the "In The Cage"/"Cinema Show"/"The Colony Of Slippermen" medley slotted a track from Selling England By The Pound between two slices from The Lamb... while "It"/"Watcher Of The Skies"--recorded in 1976 with Hackett and Bruford--spanned The Lamb... and Foxtrot. Recorded in 1992 in arenas including London's Earls Court, the two installments of The Way We Walk were first issued in quick succession at the tail end of 1992 and the beginning of 1993, with The Shorts concentrating on the band's run of hit singles, and The Longs delving into the medleys and the more extended pieces from their repertoire. Genesis Live 1973-2007 takes the opportunity to reconcile the two albums and recreate the We Can't Dance tour experience in sequence. Hits from the group's MTV-friendly era include "Mama," "That's All," "Invisible Touch"--which charted again in its live version in 1992--"In Too Deep," "Land Of Confusion," "Tonight, Tonight, Tonight," "Throwing It All Away," "No Son Of Mine," "I Can't Dance," "Hold On My Heart" and "Jesus He Knows Me." "Driving The Last Spike" and "Fading Lights" came from We Can't Dance, "Domino" originally appeared on Invisible Touch and "Home By The Sea/Second Home By The Sea" on Genesis. The "Old Medley" rounded up nine tunes from the band's early days and Collins and Thompson's "The Drum Thing" did just that. "Turn It On Again" is exclusive to this release. 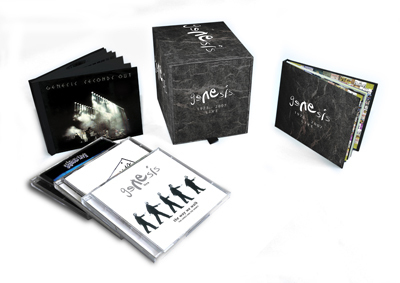 Genesis Live 1973 - 2007 has been designed to incorporate space for the most recent live Genesis release -- the 2-CD set Live Over Europe 2007. All albums feature brand new stereo mixes created by Tony Banks, Nick Davis, and Mike Rutherford, while Genesis Live, Seconds Out and Live At The Rainbow 1973 all feature 5.1 Dolby Digital Surround Sound versions.